Order in next 14 hours and 13 minutes for despatch today. 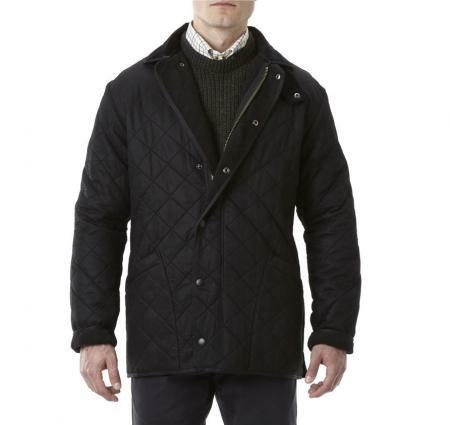 Long Duracotton Polarquilt Jacket for men by Barbour of England. The Long Duracotton Polarquilt quilted jacket from Barbour is extra warm and has a 100% wax-effect, water-repellent diamond quilted cotton construction and fleece lined collar and lining. The jacket has a 2-way brass finish front zip as well as press stud fastening and stud fastening cuffs - that lot should keep the wind out! The Barbour Duracotton Polarquilt Jacket is machine washable and available in black or olive green. The length of the jacket is 31 - 34 inches (74-82cm). Make your choice of colour and chest size from the pull down menus below.SALE!